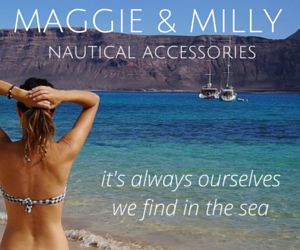 Did you know that our boat came with daggerboards? Originally, that is. We don’t have them anymore which is unfortunate, because these two stabalizing boards that once came down the aft end of our boat would have made downwind passages so much more comfortable. No rocking back and forth in the waves, but instead riding them like it was on rails. The daggerboards are meant to be used both upwind and downwnd. When sailing upwind you would lower the centerboard and lower the leeward daggerboard to help keep the boat on it’s intended course. Once you’re running downwind you raise the centerboard to bring the control aft and help prevent broaching. With the centerboard in the upright position you lower both daggerboards to give stability and help the boat steer straight. Something that would have been nice to be able to do, but now we can’t. We don’t know the history of what happened to the original boards which were in place, but we do know this. 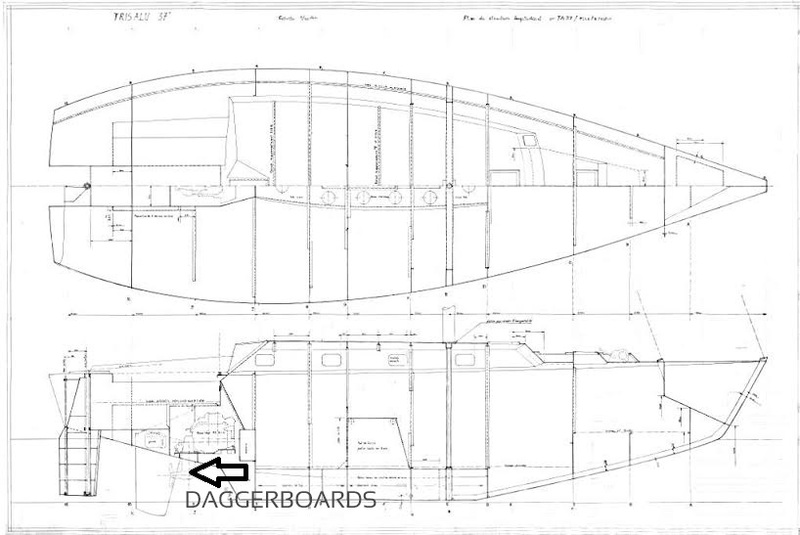 Most of the time, daggerboards are built of plywood and fiberglass. This is because they hang lower in the water than the keel and are more likely to come into contact with something in the water. In case this does happen you want them to be able to break cleanly away from the boat so there is no further or long term damage. We’re assuming this is what happened sometime in the history of Daze Off. What we do know is that at some point, for some reason or another, they were removed from the boat and the owner at the time took pieces of teak, approximately 4″x4″, coated over them with epoxy, and called it good. We also know that this was not a secure fix and eventually water leaked into the area. The wet wood against the aluminum helped to cause corrosion in the area. Because there is no way to get inside this slim area that runs 4″ by 5′, our only real option is to bring our welder back to properly seal over this area. I shouldn’t say it would be impossible to do, but much more work that it’s worth, even though we would love to have them for our travels. The back area is a waterproof bulkhead separating the lazarette. 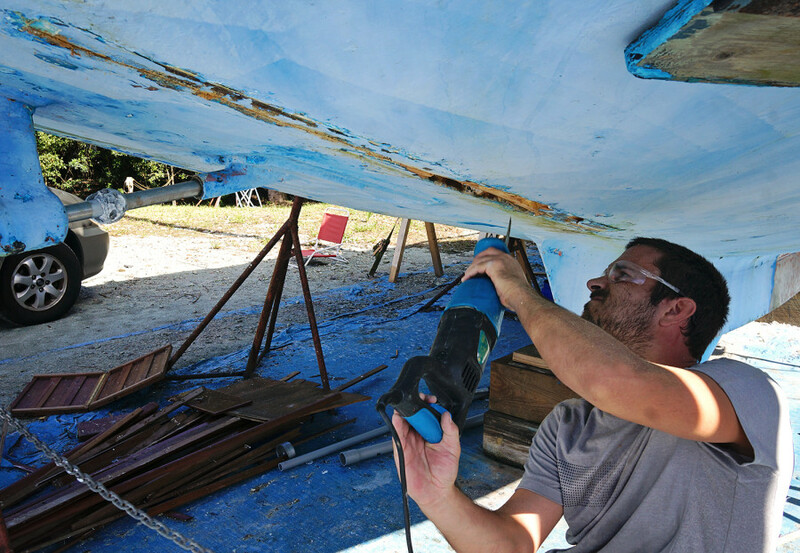 If we did want to put all the effort into properly welding the area to be able to put new daggerboards in we’d have to cut open the cockpit, remove engine, and go through a number of extra steps that are unfortunately not worth our time and energy. 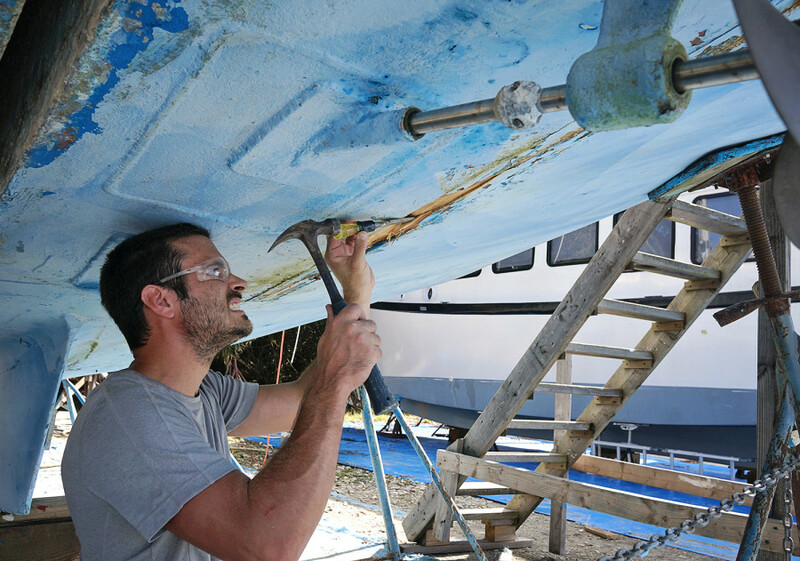 Before we can have our welder come out to close the area off, Matt had the unfortunate task of trying to remove the teak and clean the area out. Much easier said than done as those boards were shoved up there something fierce, and we’ve been using everything we had in our arsenal to get them out. First it was small things like a hammer and chisel, or a hammer and our pry bar, but those barely put a dent in to teak. Eventually we were able to track someone down in the yard that had a reciprocating saw, which allowed Matt to get the depth he needed in there to really break the wood up. Once he had that, everything began to cleanly fall out. We’ve just given the area a power wash and it should be good to go for our welder the next time we get him out here. One more project knocked out! Welded patches above are from the boat’s original Saildrive, which was removed and replaced with a normal prop shaft when the boat was re-powered with a Yanmar engine. 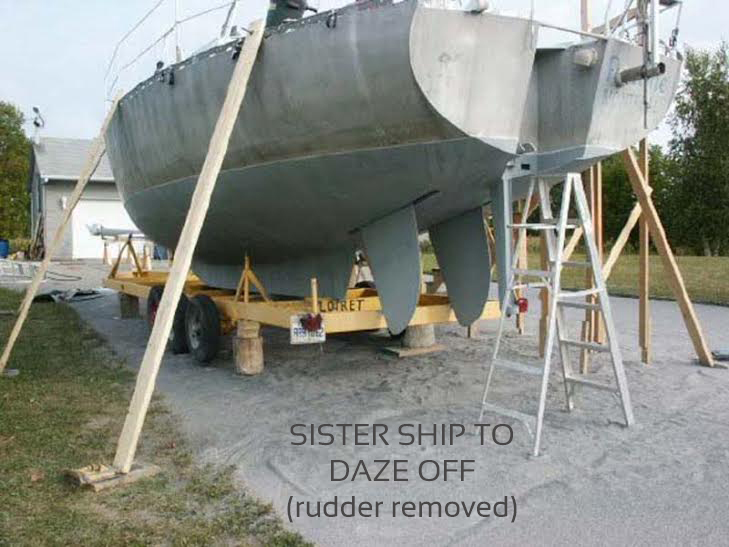 This entry was posted in Boat work - Trisalu 37 and tagged bottom work, daggerboards, welding. Bookmark the permalink. Sealing up these “voids” will not prevent the corrosion inside them from continuing to propagate. If you truly want to eliminate the problems from these wells in the future, you should cut them out of the hull entirely, it will also give you storage/living space inside the boat. Frankly, I think you should rebuild the intended purpose of these features on your boat/home. The person who designed that, was likely not doing it for no reason. Maybe they were full of drugs and were destroyed by the DEA? 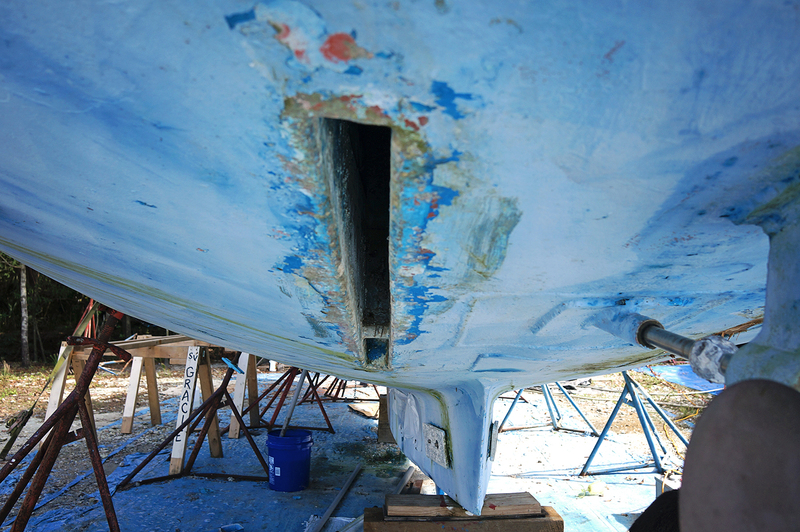 It’s amazing to look at the welded patches from the boat’s original Saildrive up-close like these pictures. 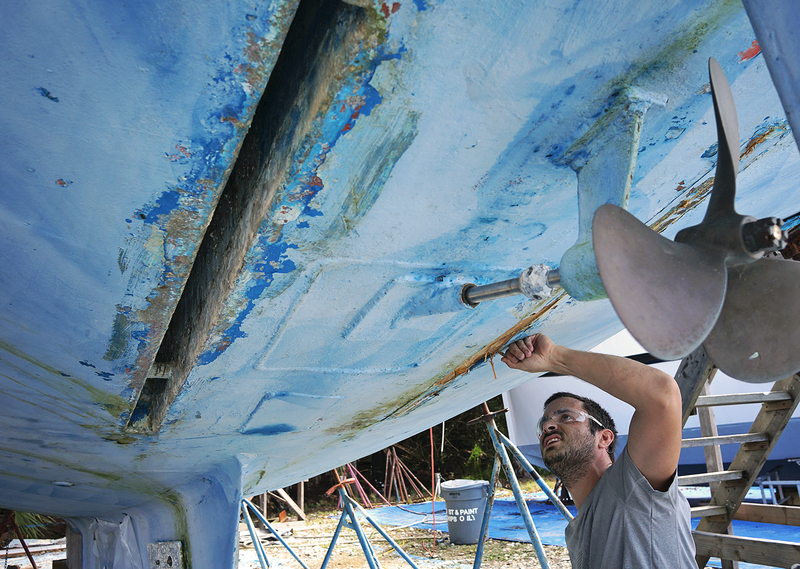 Cleaning and repairing these large boats seems pretty important. 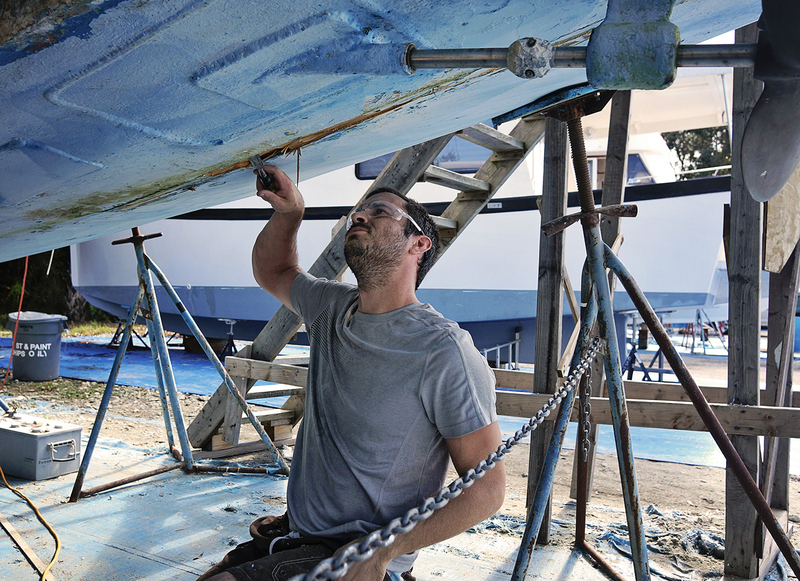 I would imagine that most marinas would want to have a few professionals who can service, clean, and repair these types of large boats. Interesting stuff. I don’t know that much about boats, so it’s always fun to learn more. Thanks for sharing!